I love wearing maxi dresses, but because of my height I am unable to pull it off. Plus, over the last few years I have gained (a lot of) pounds. School, stress and even the weather (plus my laziness) has made me regret some of my past choices. Overall, my height and my recent weight gain made me stay away from maxi dress. 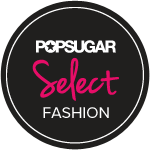 However, during the month of August team up with Grab My Look to showcases their recent Maxi Dress Collection. For some reason, I just received the package this Tuesday evening due to some delivery issues. 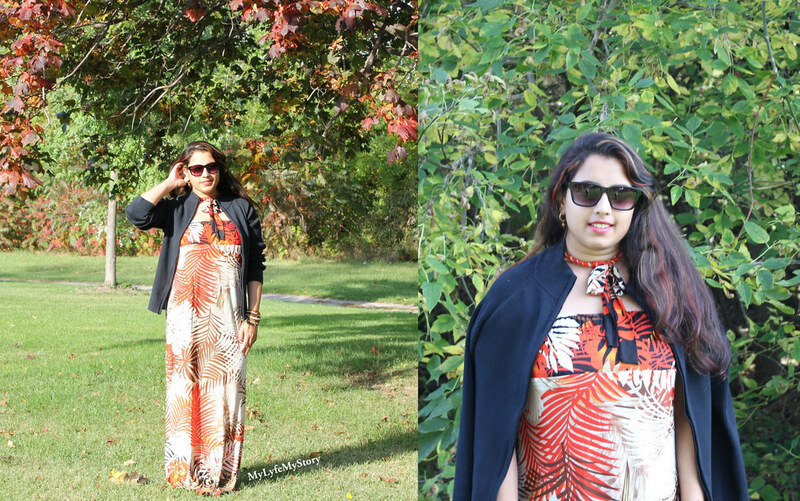 Grab My Look gave me the opportunity to choose the dress of my choice to review. For some reason, I decided to choose the Orange and Black Palm Leaf Halter Neck Strapless Vintage Retro Bohemian Style Long Maxi Dress. The name of the dress is the perfect way to describe this dress: Orange and Black Palm Leaf Halter Neck Strapless Vintage Retro Bohemian Style Long Maxi Dress. It's follows the fall colour theme with orange and black as the key factor. I decided to focus on the colour black by pairing this dress with a thick knitted black sweater from H&M (since it's freezing in Toronto), plus it is autumn. The dress has palm leaf prints from head to toes with a halter neck. Instead of wearing this dress in the traditional halter style. I wore the dress backwards, and used the halter neck straps to create a bow tie around my neck. I actually liked the way it turnout, so kept the jewellery simple by just adding some chunky set of wooden bracelets to my left hand. Overall, really proud of this look since it was the first time I was able to break my lack of confidence. 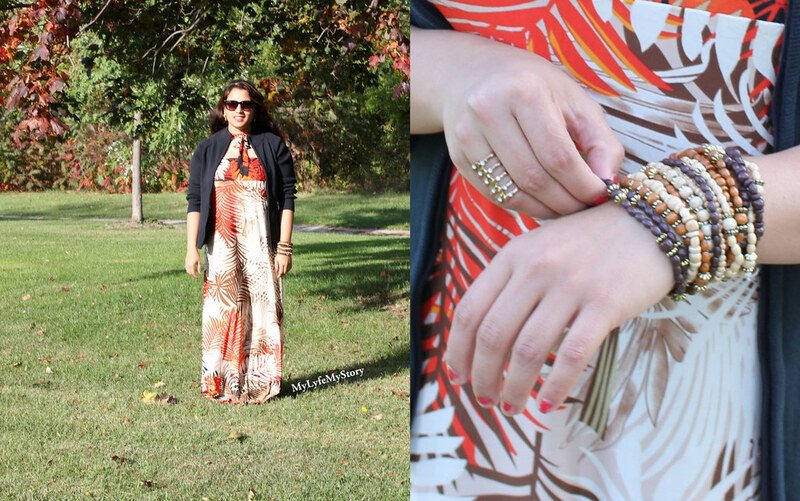 Even though, I have worn maxi dress in the past, they are most in chiffon material. 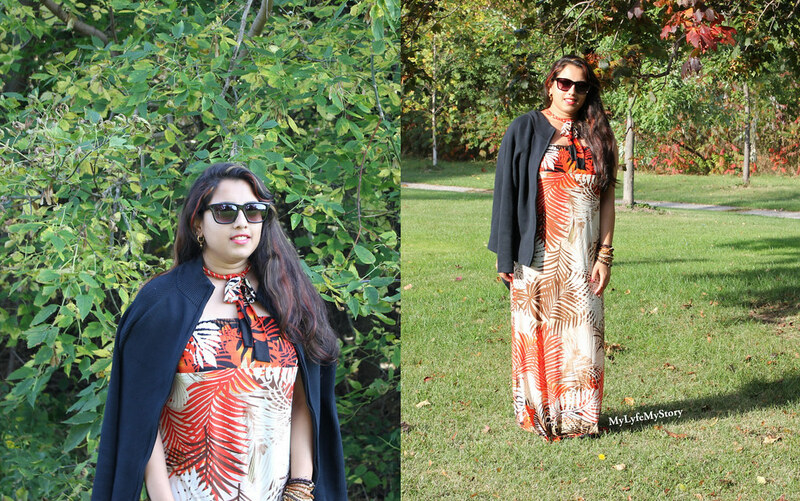 However this particular one, Orange and Black Palm Leaf Halter Neck Strapless Vintage Retro Bohemian Style Long Maxi Dress from Grab My Look tends to hug my body (which I normal tend to avoid). In the end, extremely proud and happy with the outcome. So, what do you think about this look and how about the "backwards" trick? That dress is gorgeous and looks amazing on you! I think this dress looks great on you. I would never have known it was on backwards if you did not tell us. It looks great in reverse. I'm sure you would look great in this the other way as well. Have a fantastic weekend! Love the way you wore this dress! Impressive!! I love the print and the dress looks great on you! I've never found a maxi that works on my petite frame, but this one is a nice option. You look pretty, and I don't think your height is an issue at all, its about confidence that we sometimes don't feel the right way. Hi Dear! This dress is very beautiful! 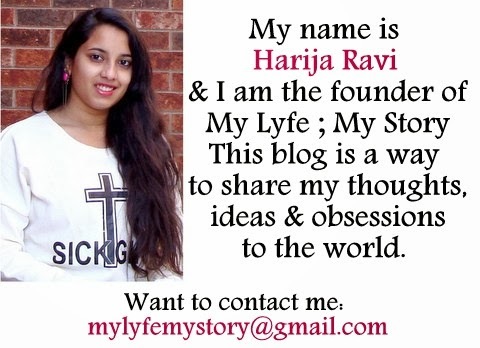 Looking beautiful, Harija. Lovely Fall look. omg that is so creative of you! I love the "backwards" trick, hun! The tie neck is super cool! You look stunning in this maxi dress luv! I love the backwards trick. 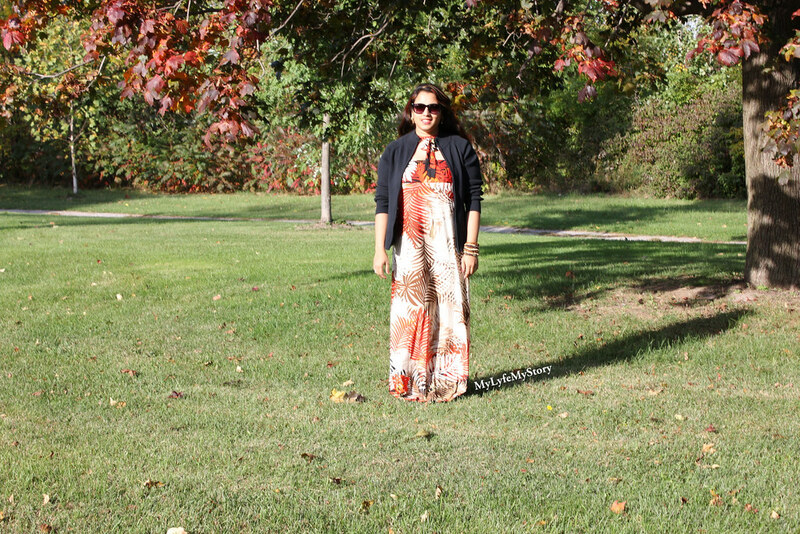 I don't typically wear maxi dresses in the fall because I think it's too cold but I'm sure I can wear layers to keep me warm. I wear maxi skirts and dresses year-round here in Brisbane, but that's because it never snows here haha! So beautiful pictures.. Loved the dress..
You have every reason to be confident, beautiful lady! I love this dress! You look o pretty! Have an amazing week! This dress looks perfect with the scenery! U pull off this look very well!